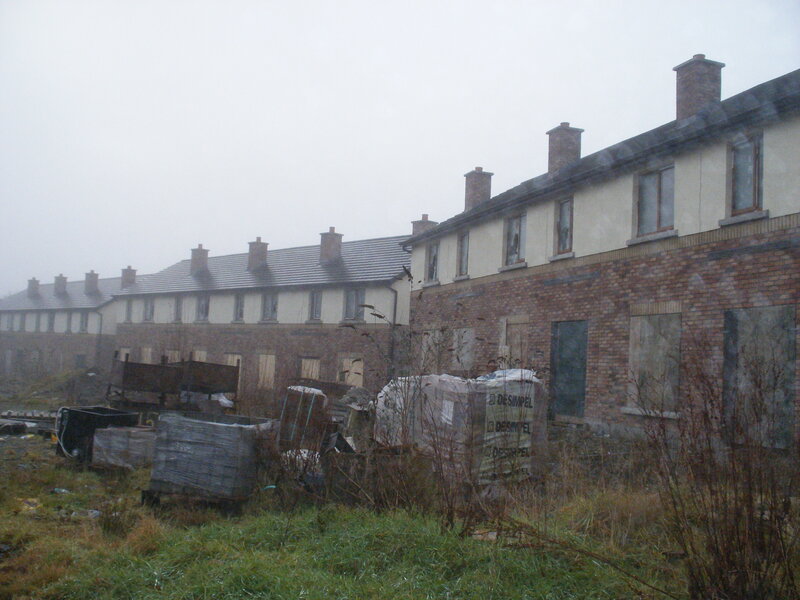 The helpful engineer visited two Irish ghost housing estates in County Longford. 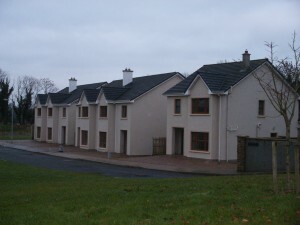 The first housing estate has been completed and is a small estate of 18 houses with only one occupied. The remaining houses are completely finished but remain unsold. 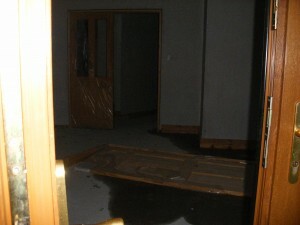 The unsold houses have been vandalised with broken windows, broken doors and boilers stolen. No precautions have been taken to protect the houses against thieves or against potential natural damage, i.e. the water wasn’t turned off and some of the houses are flooded after the recent cold weather burst water pipes. It seems amazing that no effort has been made to protect these assets by a small outlay for security or fencing. See photographs below. 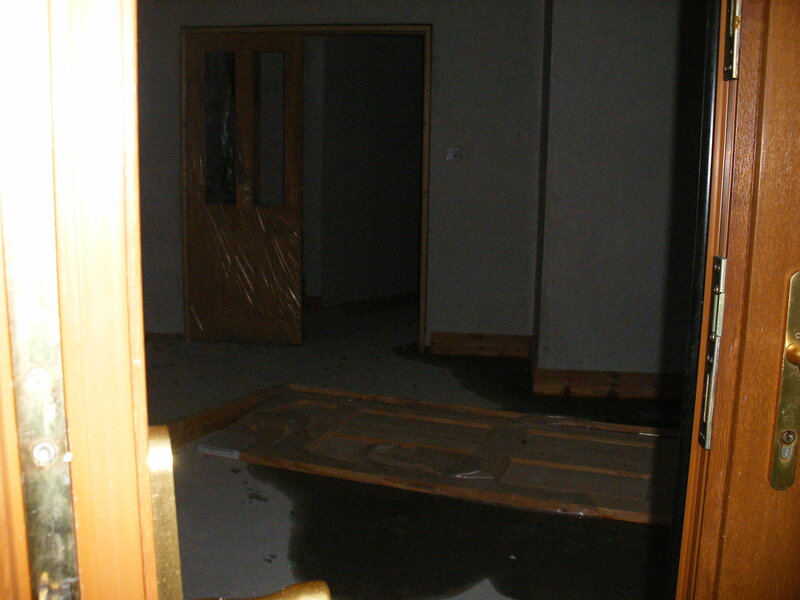 The other estate shown is part of a larger development of completed and occupied houses; the photograph shows the second phase of this development remains unfinished. See photograph below. At the height of the boom 90,000 houses were built in 2007 in Ireland. This compares with an estimate of only 7,500 for this year. 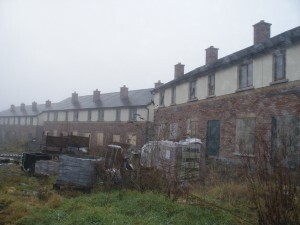 It is estimated that there are approx 2800 ghost estates with 43,000 empty houses located around the country. But what should be done with these empty houses? In my opinion the first thing is to secure the site and houses to ensure no more damage is caused to them by vandals and thieves. Next regular inspections should be carried out to ensure the remaining asset value is protected by ensuring reasonable precautions are taken so that the houses aren’t damaged by water leaks from burst pipes (as above) or rain penetration. Then choices have to be made, the finished houses should probably be sold off as cheaply as necessary with some used for social housing. What happens to the unfinished houses should be decided on a case by case basis, with some being finished and other being knocked. The finished houses could be then sold or put to many varied uses, to name a few: rented out as holiday homes, low rent building for start up small businesses, or even areas for urban warfare practice for the Army or venues for air-soft games (pellet gun games which is becoming very popular at the moment). Meanwhile the Government has established a group of experts to recommend solutions to the problem. What does anyone else think should be done?